What are your biggest daily challenges? Maintenance costs? Lack of qualified personnel? Ever-increasing fuel outlays? Safety concerns? Easy access to capital? The answer is probably “All of the above”. But there’s another problem you face; one that isn’t discussed very often: On-board pests. And they’re a big group of riders: fleas, mites, roaches, bed bugs and just about every other creature that hops, crawls or flies. However, the problem has less to do with the way you manage your vehicles or the sanitation procedures you employ. The main offenders are your own riders! They’re the ones who generally carry these pests on board. The bugs arrive secretly, on luggage, clothing, carry-ons, even on shoes and sneakers. And there’s no way to really tell which of your passengers are giving these ‘hitchhikers’ a ride. Upright, well-groomed riders can also work as unwitting ‘couriers. So. How do you tackle this problem? How do you get rid of bed bugs, mites, roaches and the rest? Your first line of defense is your own employees: your drivers, conductors, cleaning and maintenance staff, baggage handlers, and ticket agents. Your staff members don’t have to become amateur entomologists, but they should be aware of what these pests look like and how they behave. But most important, they should report any pest problem immediately! You can, of course, tackle the problem yourself, but this is only feasible if you’re a small operator, in which case it’s probably easy for you to take your vehicle(s) out of service for a short time. If you use commercially available pesticides, you can be reasonably confident that you have the problem in hand. Whether you’re dealing with bed bugs or roaches or fleas or lice‒or a nasty combination of all four‒ your first priority is to eliminate them. 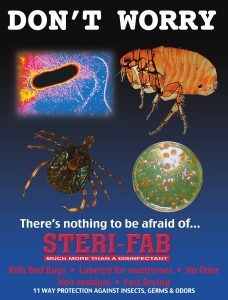 For this, we suggest that you use our own Sterifab. As an EPA-registered product that is non-residual, it’s acknowledged to be among the most efficient and cost-effective agents available today. 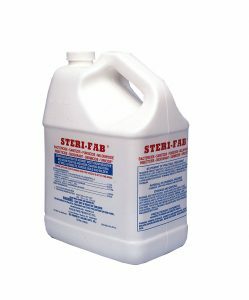 It’s a really powerful and very potent agent for eliminating insects, as well as fungus and odors. 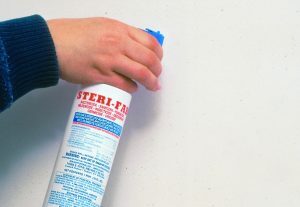 However, even the best products, applied carefully and in accordance with their instructions, cannot always guarantee that the pests have been eradicated. In fact, unless you get to the true source of the problem, there’s a very good chance that you’ll experience repeat infestations. But don’t feel bad! This occurs more often than you’d expect, which is why it’s probably good idea to consult a professional and reliable exterminator. Once the bugs in question have been eradicated the vehicle (or vehicles) in question can be returned to service. Still, they should be re-inspected regularly. You should make pest inspections part of your regular maintenance operations. If you are fortunate enough to run a fairly large operation, you should also be aware that the bugs that invade your buses can, and probably will, overrun your ticketing areas and waiting rooms, storage facilities, garages and service sheds. Even lockers, public seating, and bathrooms are not safe. In fact, going forward you should have a plan in place just in case you are unlucky enough to suffer another bug ‘invasion’. It would be in your best interest to devise a defined action plan, with detailed procedures for responding to a bug infestation. That protocol should also include a requirement that the engineer/motorman/driver who discovers the infestation problem report their findings immediately. If possible, the employee should also try to collect a specimen for professional identification. That can save you an enormous amount of time and money in the long run! One last point: Not only do you and your staff need to know how to respond to reports of bug infestations, you also need to be aware of what can happen if you don’t! If you don’t respond ̶ immediately ̶ to a bug problem you could end up seeing your business suffer. Big time! Keep in mind that it’s easy to post negative comments on the internet, as well as social media outlets. One truly negative post can serious impact your business. And your reputation can vanish if you don’t handle complaints wisely and promptly. Worse still, a lack of response on your part can lead to worse than negative web reviews. You could well end up on the wrong end of a lawsuit (or two or three). Customers who discover that they are the unwilling hosts to pests picked up on your buses probably won’t accept an apology and a few free tickets. They’ll demand monetary compensation. So, not only will you pay a financial penalty, but there’s a better than even chance that the case will make its way into your local newspapers, and that can be a real threat to your business.